WASHINGTON, D.C. - U.S. Senator Frater Robert Byrd (Alpha-Pi, George Washington Univ.) is celebrating a birthday. 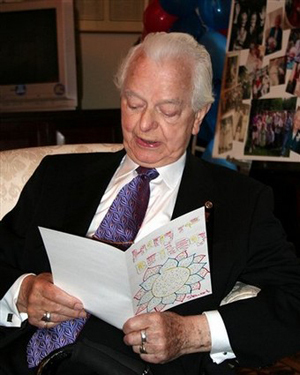 Senator Byrd turned 91 years old on Thursday. The man who has served the longest in the U.S. Senate was receiving 'Happy Birthday' wishes from everywhere to mark the day. "For half a century, West Virginia has had Senator Byrd leading us uphill and for that, our state is truly blessed. As the longest-serving Senator in American history, Senator Byrd will be written about in history books for decades to come. His longevity is something that continues to move me. And it's something that speaks to the core of who Robert C. Byrd is: he's a man who stands up and fights for what he knows is right, and a man who never, ever gives up. "But as incredible as his Senate career has been, when one tells the story of Robert C. Byrd, there's one special part that unquestionably can't be left out - his beloved wife, Erma. "Calling her 'the wind beneath this Byrd's wings,' Senator Byrd will tell you that Erma was the reason he reached his goals. With a presence that he describes as quiet yet strong and reassuring, Erma was his soul mate - his best friend and his confidant. From a fiddle-playing young man, to a history-making American icon, she loved him, and supported him all the way. "I want to wish Senator Byrd a happy 91st birthday and thank him for his unswerving faith in West Virginia. May he celebrate many more." The Offices of the Grand Chapter extends a heartfelt Happy Birthday to Frater Byrd. Adapted from West Virginia MetroNews. If you would like to see your chapter news here, contact Director of Communication Tom McAninch.